For the first time on The Mouse Connection, we are welcoming a guest blogger, Lori Potter. Lori and her family just went on their first Disney Cruise and she kindly agreed to share her thoughts on her trip with us. She is a mom to four kids, so she got to experience the ship through many different eyes. I hope this helps you get a feel for the cruise experience, but Lori did warn that she doesn't want you to know every single thing that will happen. In her words, "Some of it needs to be magical!" 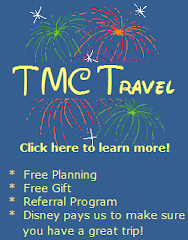 When my family bought into the DVC we were "given" a Disney cruise as an incentive, a 5 day/4 night on the Wonder. 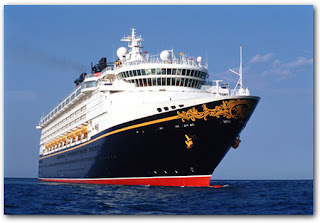 We were thrilled to say the least as we'd done a cruise for our honeymoon and always wanted to do another one, add a Disney twist and it seemed like a perfect combination. The list of available dates was somewhat limited but we settled on a week in September since my older two kids were due to be out of school. We have a large family, 2 adults, 4 kids (ages 7 - 2) so we had to book 2 rooms (one drawback, in my opinion, is that they literally don't have space for a family of 6). We used our DVC points to book our 2nd room - and we were set! The anticipation of the trip was exciting and I literally spent hours and hours reading forums and blogs to make the most of our trip. All in all we had a WONDERful time. Probably one of our best vacations ever. I can't say enough good things about Disney Cruise Lines. It's clear that service is the top priority. I also loved the family feel. There is no gambling on the Wonder (with the exception of Bingo) and though there were many adults traveling without children a majority had kids. I loved that you could have a nice dinner in the dining room and not feel bad if your kids got loud or got up from their seat. I loved that they had activities for every age group and how organized the entire staff was. And though the boat was full it only seemed really crowded at the Pirates In the Caribbean party. But of course every passenger wants to see fireworks! 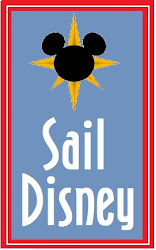 Here are a few tips/things we learned about sailing with Disney. My advice is to get to the port early. They officially open at 10am and that's when we got there. You leave your luggage (they send you luggage tags preprinted with your room number) with a porter and get in line to go into the terminal. You will need to keep a day bag with you with things like sunscreen and bathing suits as your luggage may not arrive in your rooms until late afternoon. We walked right into the terminal and got immediately checked in. You are assigned a boarding number (we got group 2) and the lower your number the earlier you will get to board - of course Disney does it all very organized! You can then check the kids into the kids club - they get wristbands and parents get a pager. That just saves you time once you get on the ship. The wait time goes very quickly - some special friends come out to greet passengers and that certainly helped the time go by! Official boarding time is 1pm but as soon as they get the ship turned over they will begin boarding however, you don't have access to your room until 1:30. Once you get boarded you are directed to one of the restaurants for a fabulous buffet lunch! We were lucky enough to see some special friends at lunch too! The mandatory muster drill is at 4pm and the stateroom hosts do an awesome job of ensuring you have the right life jackets for the people in your room. The muster drill is painless and pretty quick and immediately after you should help up to Deck 9 for the Sail Away Party. We opted for Deluxe Oceanview Staterooms on Deck 2. Deluxe means you have a split bath - meaning there is a tub and sink in one room and a toilet and sink in another. I thought the room was nice. I remembered from our previous cruise (not Disney) how tiny the rooms are but it was not bad at all. We had a queen size bed and the sofa turned into a single bed. We also had a bunk bed recessed into the ceiling which the stateroom host set up for us each evening at turndown. He even added a special touch putting princess sheets on the beds! My girls loved it! The closet was large enough to store our luggage and really space was not at all an issue. The stateroom service was fabulous and towel animals adorned our beds each night at turndown as did some yummy chocolate! I thought the food was great. Always plenty of choices on the menu. And there was a special kids menu/activity sheet each evening. For breakfast and lunch there was always a couple buffets and an ala carte option. For dinner you are assigned an time (main or late) and you are on a dining rotation as there are 3 dining rooms. One night is Pirate Night and there is a special menu which is the same in all the restaurants, that evening. You are also assigned a table number which remains the same and servers who follow you to the different dining rooms. Our family being somewhat large had a table all to ourselves but we did dine around the same families each night so we did get to meet some great folks. They do have pizza open late and on Pirate Night there is a late buffet. Room service is available 24 hours a day and they do have a beverage station where you can get sodas, milk and water all the time. The Wonder has an adult only restaurant, Palo that is available for brunch and dinner for an additional charge. I hear it's fabulous but we did not do it this time. Maybe next time! One interesting note about dining is that there is a cast member stationed outside each and every restaurant handing out sanitizing wipes before you enter any dining room. They are all about the hand washing! Each day the cruise staff prints a Navigator which is your guide to all that is going on for the day. The guide is full of great information - about shopping, the evening entertainment, dining options and a full schedule of the daily activities. The activities are broken down by theme - Special, Characters, Entertainment, Family, Adult, Kids. They have activities from 9am until 2am (or something like that!). There is literally something for everyone! The evening entertainment was great - we saw 3 Broadway style shows and Toy Store 3 in 3-D. Disney Cruise Line boasts they are the only cruise line that can show first run movies since they own them! There were several showing throughout our cruise. One highlight is Pirate Night. They have special character appearances with the characters in pirate attire and they encourage all the passengers to dress up too (we didn't but plenty of people did). There is a big party on the deck complete with fireworks and a special buffet. I hope you enjoyed Part I of Lori's post. Check back in a few days for Part II. And on a personal note, thank you Lori for taking the time to share this with us!